Before preparing to receive Jesus Christ for the first time in the Eucharist, children must first come to know and love Him at an age appropriate level. Baptized Catholic children age 7 and older. Family must be active registered parishioners of St. Augustine Church. Be actively attending Mass with family. Candidate must be enrolled in and regularly attend Faith Formation classes for 2 consecutive years. Have completed preparation for the Sacrament of Reconciliation prior of First Communion. Attend all First Communion child/parent sessions and rehearsal (only children registered for First Communion who are in their second consecutive year of Faith Formation). Copy of Certificate of Baptism with the church seal visible. First Eucharist (Holy Communion) Preparation - Saturdays, April 6 and 27, 2019 from 10:00am - 2:00pm in the Church. All sessions are mandatory. First Eucharist Rehearsal - Saturday, May 11, 2019 from 10:30am - 1:00pm in the Church. Celebration of First Eucharist (Holy Communion) - Saturday and Sunday, May 18 & 19, 2019 in the Church. 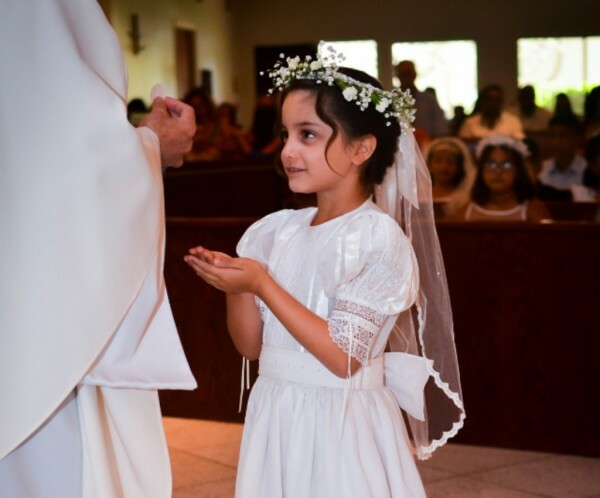 For children's First Communion information, please contact the Parish Catechetical Leader at the Parish Office at 407-695-3262 or email: ff@saintaugustinecc.org . For adult sacramental preparation, please contact the Adult Faith Formation Coordinator at the Parish Office or email: aff@saintaugustinecc.org .